In December 2008 premises in the Geneva Freeport were raided as part of a wider investigation into the antiquities market. The raid had resulted from an investigation into the activities of the London-based dealer Robin Symes. 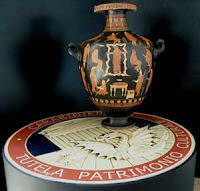 Symes has been linked to antiquities returned to Italy by the J. Paul Getty Museum, and the private collector Shelby White. The latest trail led to a Swiss-based businessman and has yielded an important dossier showing transactions. The Geneva Freeport raid yielded some 20,000 objects. (A raid on a similar facility run by a husband and wife team in Basel in 2002 yielded some 5500 objects; 4,400, filling three trucks, were returned to Italy.) This latest raid is likely to have more impact than the ones on the Geneva Freeport facilities linked to Giacomo Medici that took place in the mid 1990s. Those seizures led directly to a series of returns from major North American public and private collections (discussed here). As a result of the latest Geneva raid some 337 antiquities (worth 15 million euros) were returned to Italy. They were presented at a major press conference in the setting of Rome's Colosseum. Among them were 10 frescoes that appear to have come Pompeii (or the close vicinity) as well as Athenian and South Italian pottery. The Japanese dealer who is linked to the Geneva facility has been named as Noryioshi Horiuchi. This dealer has been reported to have helped develop the collections at the Miho Museum in Japan. It appears that the Italian authorities are investigating some 50 objects in this collection. It appears that at least one of the pieces now returned to Italy as a result of the latest raid was identified thanks to images seized from the Geneva premises of Giacomo Medici. Horiuchi appears to have business connections with the dealer Gianfranco Becchina. A number of issues remain. What will happen to the remaining antiquities that were seized in Switzerland? Will the Japanese dealer face prosecution? Will the seized documentation lead investigators to other museums and private collectors? What are the implications for the Miho Museum that is known to be under investigation? More importantly, is this the tip of the iceberg? There have now been three major raids in Switzerland: two in Geneva and one in Basel. Will there be more? And what are the Swiss authorities doing to stop the movement of recently-surfaced antiquities across its boundaries (or at least into its freeports)?